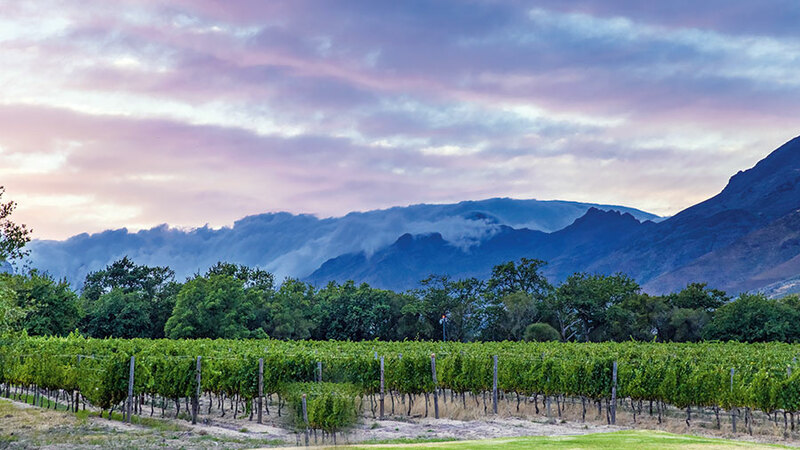 No trip to Cape Town can be complete without a visit to the Cape Winelands, a 45-minute drive from the city centre. Even a quick mention of this idyllic area to cityfolk brings unbidden smiles to instantly happy faces, probably made of memories of holidays, relaxation, scenic beauty, great food and, of course, fantastic wines. 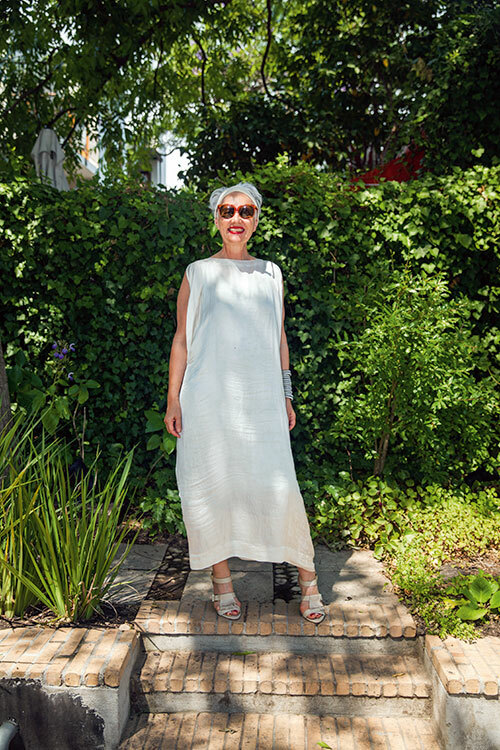 The Winelands almost seem to be a physical and psychological extension of Cape Town, a place to escape to, for a meal, a day, a week…. 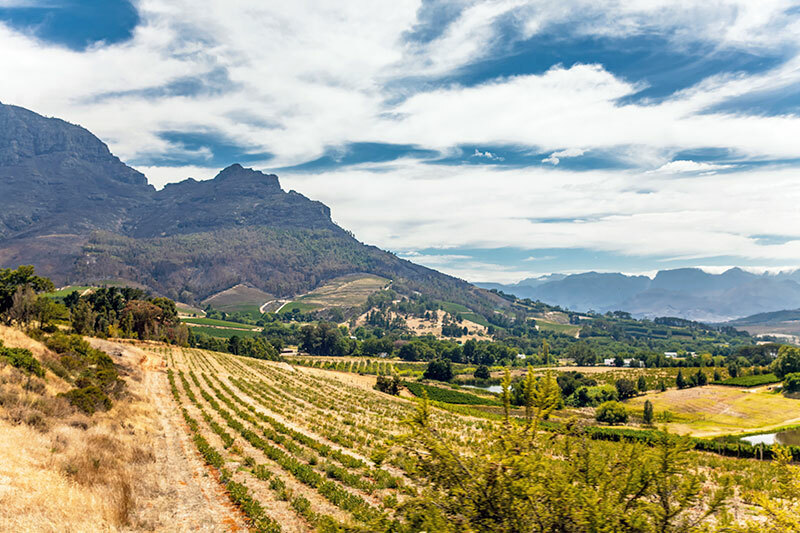 The Stellenbosch wine route is a circular route that leaves Cape Town via the N2 to the Helderberg, then over to Stellenbosch, up the Helshoogte Pass for panoramic views and back down via wine estates en route to the N1 or N2. Spend a couple of days in the picturesque town of Stellenbosch or escape to one of the wine estates that offer overnight stays. Visit several wine estates, taking in the atmosphere as each one is different from the other, and indulge in wine tastings and cellar visits. And good food paired with great wine is, of course, never far away. 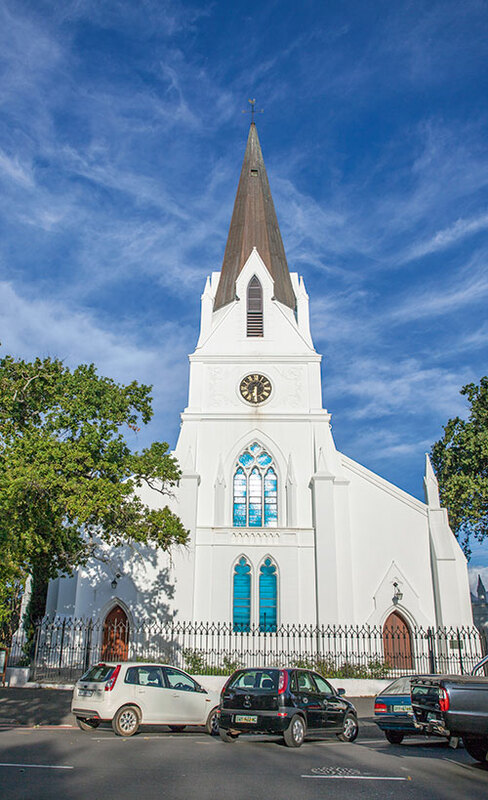 In 1971 Stellenbosch became the first wine region in South Africa to establish a wine route, an organised network of wineries, along which the aficionado may experience the region’s famous wines, in all seasons. 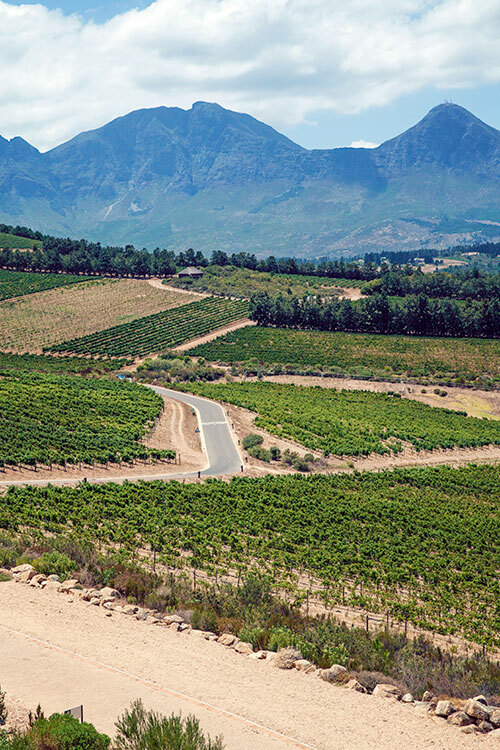 The Stellenbosch Wine Routes offer a coordinated network of more than 152 wineries, each with a unique cellar door experience. This has been divided into five sub-routes to make travelling on them easier. The history of this area is closely tied with that of the early European settlers. In 1652, Jan van Riebeeck established an outpost for the Dutch East India Company on the shores of the Cape of Good Hope. He was succeeded by Simon van der Stel who founded what would become South Africa’s second town, Simon van der Stel de bos (Simon van der Stel’s bush) later contracted to Stellenbosch. Van Riebeeck had planted the first vines at the Cape in the Company’s Garden in Cape Town and after the establishment of Stellenbosch, more vines were planted here. In the time of King Louis XIV of France, 150 Huguenots were given refuge from prosecution in the Cape. From 1688 they were granted land mainly in the area around Franschhoek. The Huguenots brought with them an advanced knowledge of viticulture, which together with the mild weather and unique terroir, made this the centre of South Africa’s wine industry. The town of Stellenbosch is situated on the banks of the Eerste River (First River) in the midst of spectacular scenery. It has been called Die Eikestad which means ‘city of oaks’ due to its many sprawling oak trees that line the narrow streets, the oldest dating back to 1812. These had been planted with hopes of fashioning wine barrels but the wood proved too porous and today they provide shade and beauty instead. 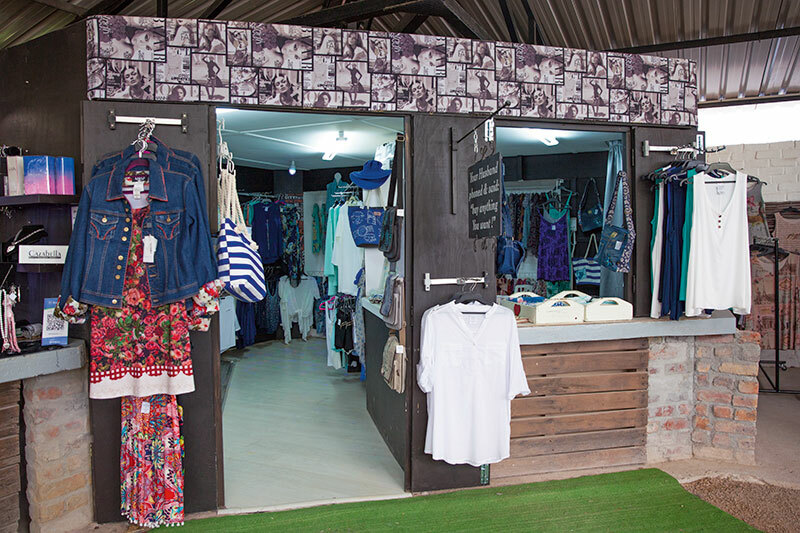 The streets are lined with stores, cafes, artist studios, restaurants, guesthouses, hotels and public art. Souvenir and antique shops, art galleries and pavement cafes abound on Church Street. This is a cultured town with history, art and heritage in evidence. A mix of architectural styles imparts a quaint look to the streets. Cape Dutch, Georgian, Regency and Victorian buildings, with stark whitewashed facades, offer variety. 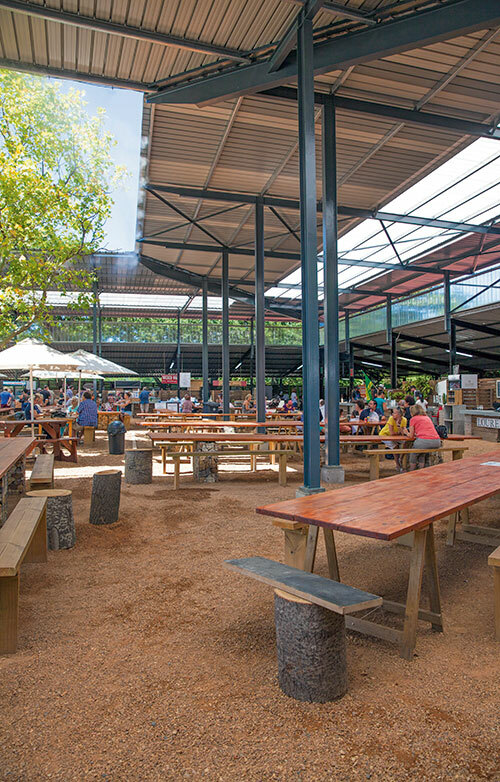 Here too is located the prestigious Stellenbosch University, a world-class institution, imparting the look of a large village and student hub rolled into one. And of course where there is a university, there will be sport. For well over a hundred years, sport has been closely associated with Stellenbosch and its university has become the country’s finest training ground. Stellenbosch also boasts the world’s oldest rugby club. Bicycle around the shaded streets; visit Oom Samie Se Winkel (Uncle Sam’s Shop), an ancient general store retaining its original look, for bokkoms (dried fish) and biltong (dried meat) on Dorp Street which has one of the longest rows of surviving old buildings in any major town in southern Africa. Wander the university campus, pay a visit to the Village Museum, pop into the Burgherhuis Museum, a classic Cape-Dutch home, or spend the afternoon people watching at a pavement cafe. There is so much to do here but the main thing would be to actually get out and about…. Stellenbosch provides a springboard to explore the myriad wine farms that could be a day’s outing or more. 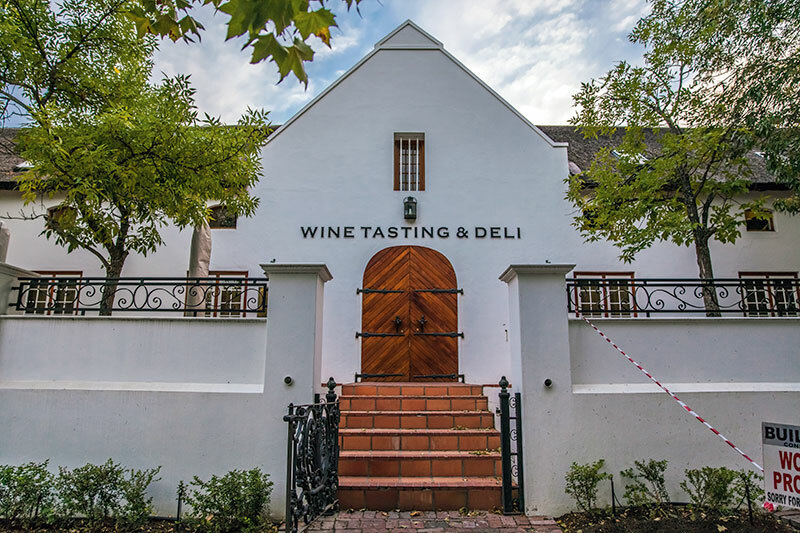 Explore the Winelands and taste some of the world’s finest wines. The wine farms in the region range from magnificent traditional estates with stately manor houses, fruit orchards, rose gardens and lawns to modern estates with state-of-the-art cellars. The tasting experiences offered too are different, combining wine tasting with cheese, biltong, chocolate and other accompaniments. These wines are complemented in some estates with restaurants serving exquisite food. Many wine farms offer activities like birdwatching, boule, carriage rides, fishing, game drives, horse riding, hiking trails and wine drives. There are golf courses too for the interested. Here are some farm estates worth visiting…. Nestled in the foothills of Stellenbosch’s idyllic Jonkershoek Valley and steeped in a history dating back to 1692, this hotel with a five-star rating has 48 luxurious rooms and suites, a state-of-the-art conference and event facility and two boardrooms in its historic manor house. We have a wonderful lunch at the fine dining Governor’s Hall Restaurant, with its damask tablecloth-covered tables and silent servers. An al fresco lunch is available on the shaded Terrace Restaurant or a picnic-basket meal on the award-winning lawns and garden, all paired with the estate’s iconic wine range including their unique Pinotage. You could also grab fresh, artisanal offerings from the deli for a light meal. This 155-hectare, working wine estate is surrounded by dramatic mountain ranges and vineyards, offering an ideal venue to spend a couple of nights to explore the area from. The Lanzerac Spa is an ideal place to relax in five-star comfort. 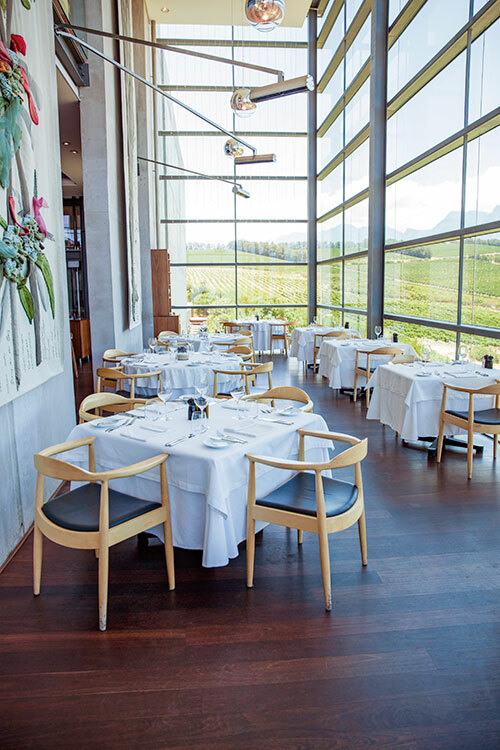 The Lanzerac Wine Tasting Room offers several wine pairings and gala dinners in the maturation cellar. ‘We’ve been preparing for your arrival for over 300 years’ runs their catchline and the experience proves this to be true. We are seated on cushions in a tree-lined courtyard sipping bubbly at 10 in the morning, and listening to the song of the cicadas and the Waterford fountain, which has been immortalised on the Waterford wine bottle label. In this, the first week of harvest, things are busy as we take a tour of the cellars and bottling facilities. The cellar, with its 1,300 imported oak barrels, is unexpectedly hung with chandeliers: “This room is called our cathedral,” says our guide. Wine is a religion here, we realise, as we set off on a wine drive in a safari-type, game-viewing Land Rover, through the vineyards on the slopes of the Helderberg. 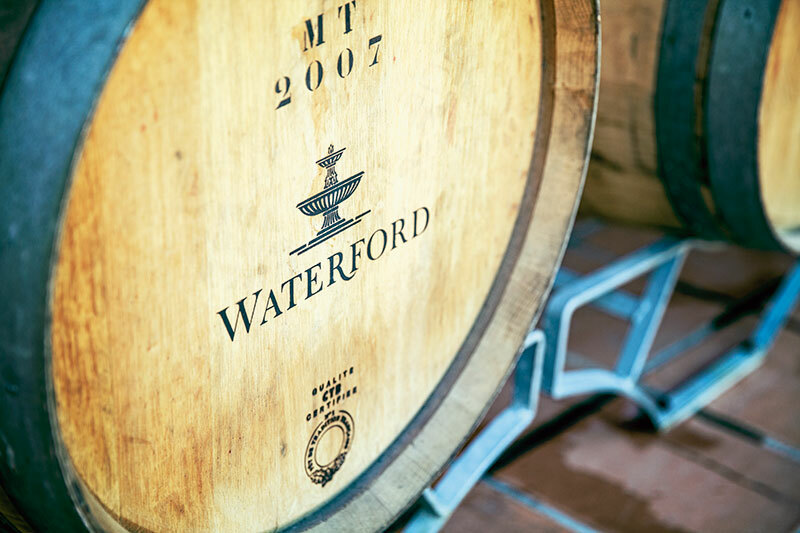 “The Waterford Way is a philosophy that celebrates prosperity, life, food, wine, family and friends and guides all that we do here at Waterford,” we are told. Nestled in the picturesque Blaauwklippen (‘blue stone’) Valley, the 120-hectare property boasts orchards, citrus groves, rolling lawns, ponds, lavender beds as well as tracts left untouched, to preserve the natural fauna and flora. The idea of the ‘safari’ is to taste award-winning estate wines in the vineyards of their origin, and we are expertly guided through the aspects of what makes this area so biodiverse and unique. This is such a delightful experience, with the mountain ranges all around, the precision of the rows of vines, the tall trees along the boundaries. 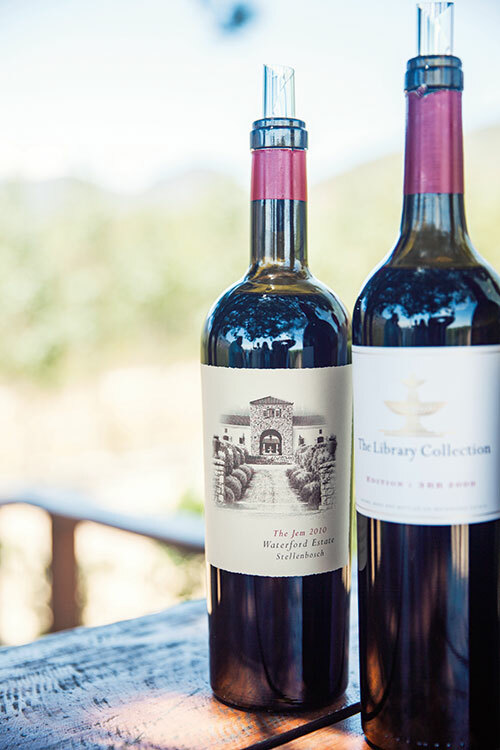 Having experienced the terroir that makes these wines so inimitable, we return to the winery, the architecture of which is inspired by the classic Bordeaux chateaus of France, for a wine and chocolate experience. A series of milk and dark chocolates is paired with the estate’s Shiraz, Cabernet Sauvignon and Natural Sweet wines. It is interesting to see how the notes of the wines change and resonate to the sweetness or bitterness of the chocolate, imparting a feeling of immense well-being. Visit for a true-blue luxury Winelands experience. The first thing that strikes me is the art all around, starting with powerful examples of Dylan Lewis’ towering cheetahs in the vast gardens. 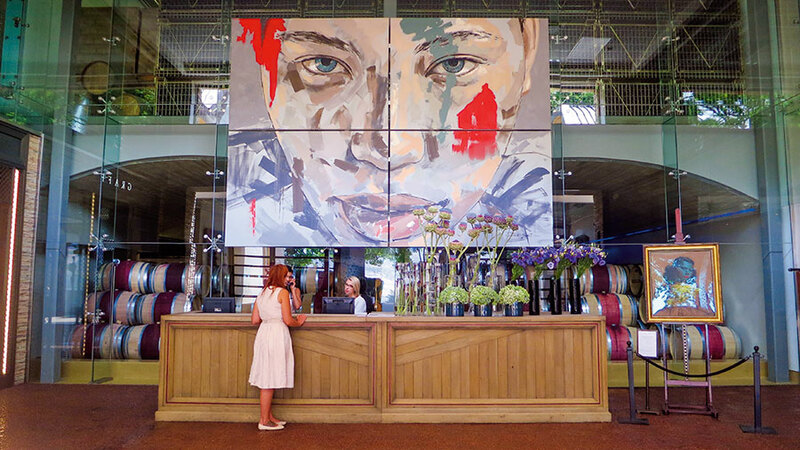 This is indeed a world-class art destination, showcasing pieces of Laurence Graff’s (of Graff Diamonds) carefully curated collection of some of South Africa’s finest contemporary artists. The setting is astounding: luxury lodges offer uninterrupted views of the Stellenbosch Valley with sweeping vistas of the vineyards. The spacious light-filled lodges each come with their own private, heated plunge pool. The dining here is world-class with green gastronomy at the heart of the cuisine. Fruits, vegetables and herbs are picked seasonally from the estate’s greenhouse and gardens, for optimum freshness. 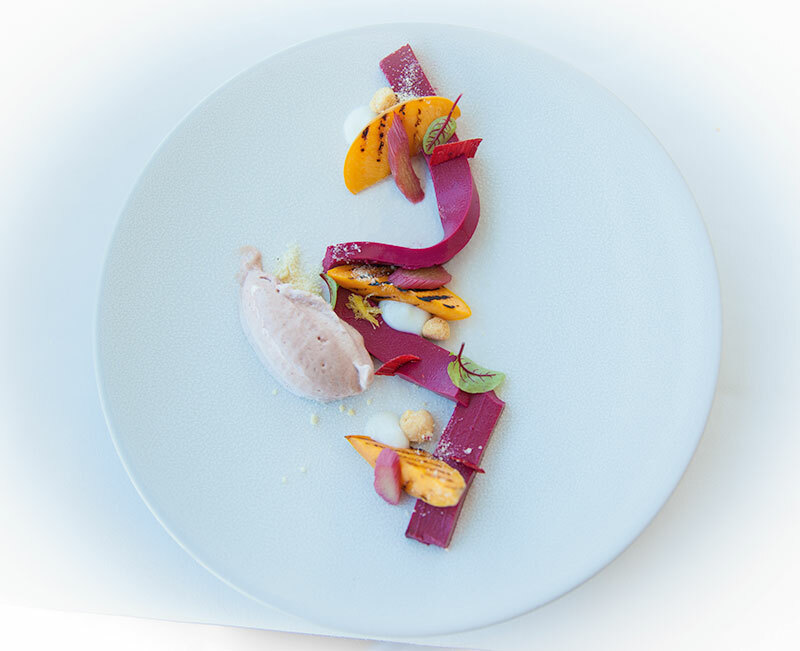 The Delaire Graff Restaurant offers its signature bistro-chic cuisine and Indochine serves up pan-Asian fine dining while the team is always happy to advise on private dining events. The Delaire Graff Spa offers a panoramic retreat for rejuvenating spa therapies and skin treatments like the Diamond Tip Microdermabrasion, while more active guests may visit the gym for the latest machines and free weights. 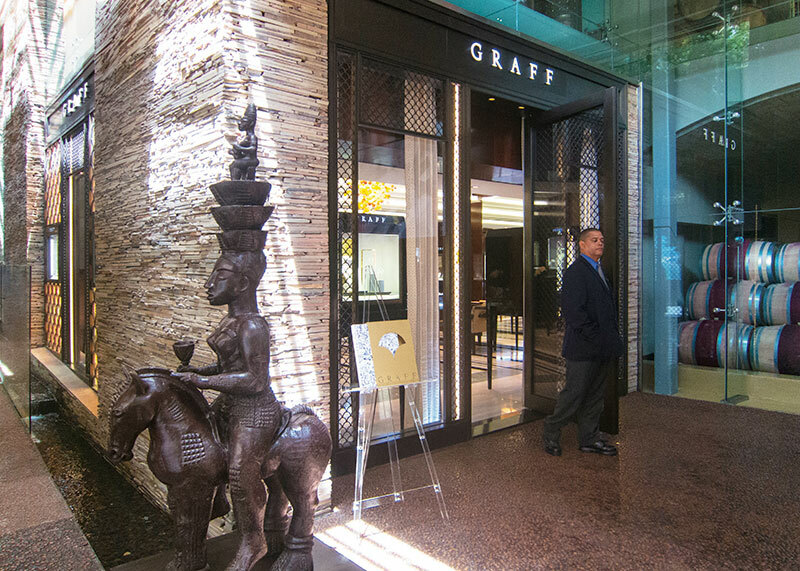 And after all that hard work, for some high-end retail therapy, visit Graff Diamonds for sparkling gems, 100% Capri for fine linen clothing and homeware and VanaShree for handbags and accessories crafted in sustainable crocodile, ostrich, python and stingray leathers. It’s Sunday morning, market day at the Laurensford Wine Estate. Under a permanent roof structure, making it an all-seasons market, a live guitar boosts things up while we roam jewellery stalls, taste the aromatic coffee, consider barbecue, Greek food, beer made on the premises and of course the estate’s wines and some refreshing honey liquor, even as the premises are overrun by families and pets. The manicured gardens outside feature two artists’ studios displaying original works. The estate, established in 1700 has 135 acres of quality vineyards, orchards of apples, pears and plums, and is bordered by the ranges of the Helderberg and Hottentots Holland and lies eight kilometres from the sea. The beautiful mountain slopes are covered by pine plantations, trout is cultivated in the streams for the exclusive fly-fishing club, people come from afar to stock up on their coffee from their roastery or eat delicious meals at the Millhouse Kitchen restaurant. Site of fabulous weddings and international film shoots, the property also boasts a rare polo field. We are perched seemingly at the very edge of the Schapenberg Mountain with spectacular vistas of False Bay and the sea, in a glassed promontory, where the estate’s signature restaurant’s French chef, Gregory Czarnecki, serves classical cuisine with a modern French touch.He uses the freshest ingredients like free-range eggs and farm-reared Schapenberg lamb. The modern interiors have a touch of the rustic and a contemporary fireplace takes pride of place together with the open-plan kitchen. It is an excellent meal washed down by the estate’s exceptional Sauvignon Blanc, perfect for this very hot afternoon. Proprietor Paul Boutinot meets us at the lunch table. “First of all, our wines do not taste like Stellenbosch wines…technically we are Stellenbosch but we call ourselves Schapenberg wines.” Schapenberg in Afrikaans means ‘sheep mountain’, and these animals have been reintroduced in the area to fertilise the land, as part of Boutinot’s eschewing of conventional farming methods for natural biodynamic farming, to produce fine wines with a sense of place. “Our farming is based on old Indian farming techniques,” he says. “We use horses for ploughing and the actions that we take are determined by the movements of the moon and stars….” Going back to basics, however, seems unreal here, in this fabulous glass building on the mountainside. This has got to be one of those life-affirming moments…. I am petting a cheetah, up-close and personal, and can feel the strong purring of this stiking animal under my happy fingers. 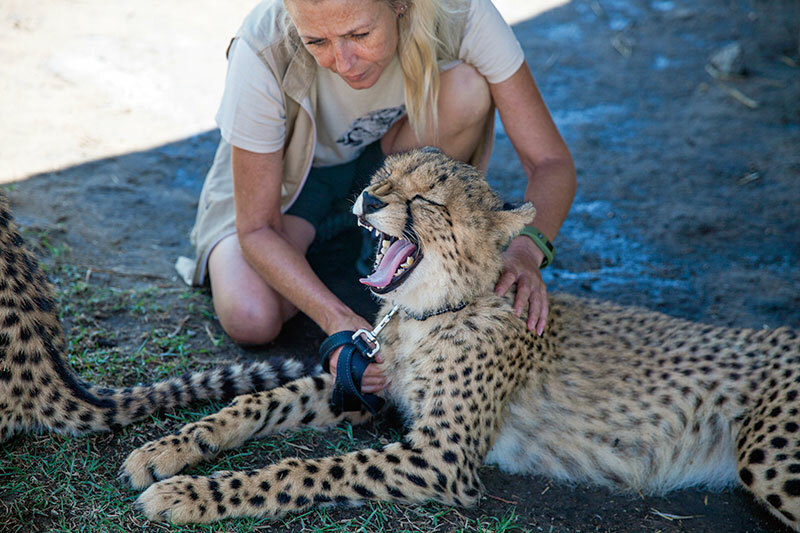 Goliath, a rather large cub, is hand-reared, captive-born and an ambassador for the endangered free-ranging cheetah, at the Cheetah Outreach project near Somerset West. This has been set up to educate people about these wild cats and raise funds for initiatives to prevent their extinction in South Africa which today has 1,000 of only 7,500 in the world. The fastest animal is heading, very quickly, for extinction! Reluctantly leaving our new magnificent friend behind, we meet the Anatolian shepherd dogs that are part of the plan to address the conflict between South African farmers and these predators that attack their livestock. These dogs have for centuries guarded flocks of sheep and once trained, they are given to farmers, ensuring that they can continue to make their livelihood. The funding comes from the people who visit these felines, take photographs with them and learn more about their conservation. Visit for that photo op as well as to make a difference! Nocawe is dressed in her finery for dinner. Her friends and neighbours shout to her as we walk down the narrow streets of the black township of Kayamandi (‘nice home’ in the Xhosa language), a place that symbolises the cruel segregation of South Africa’s former apartheid regime, today a suburb of Stellenbosch. This has got to be the most breathtaking view, I am thinking. We walk past homes made of tin sheets and a bar that boasts a fridge with a glass door. Nocawe can only be proud of her pretty home. Her sister is the chef this evening and serves us some home-made ginger beer and local African food. We start with magwinya (fried bread), chicken, umngqusho (corn and beans), tomalo (spinach), uthanga (pumpkin) and chakalaka (vegetable stew). The dessert consists of dumplings soaked in sugar syrup. The conversation is about South Africa, India and the world and we feel completely at home here, with this hospitable family.